I wasn't getting tons of stuff but my grocery list was a decent enough length, so I knew I had to plan my attack carefully. Douse cart in High Octane Industrial Strength Germ Killer, then try to prevent her from touching it directly anyway. Hit all the aisles in order - no time for back-tracking. Avoid well-meaning old ladies that are going to want to fondle Maddie's face and thereby throw her into a Screaming Tizzy. Constantly survey Maddie's hands for the coupons that she mysteriously keeps sneaking out of my pocket. 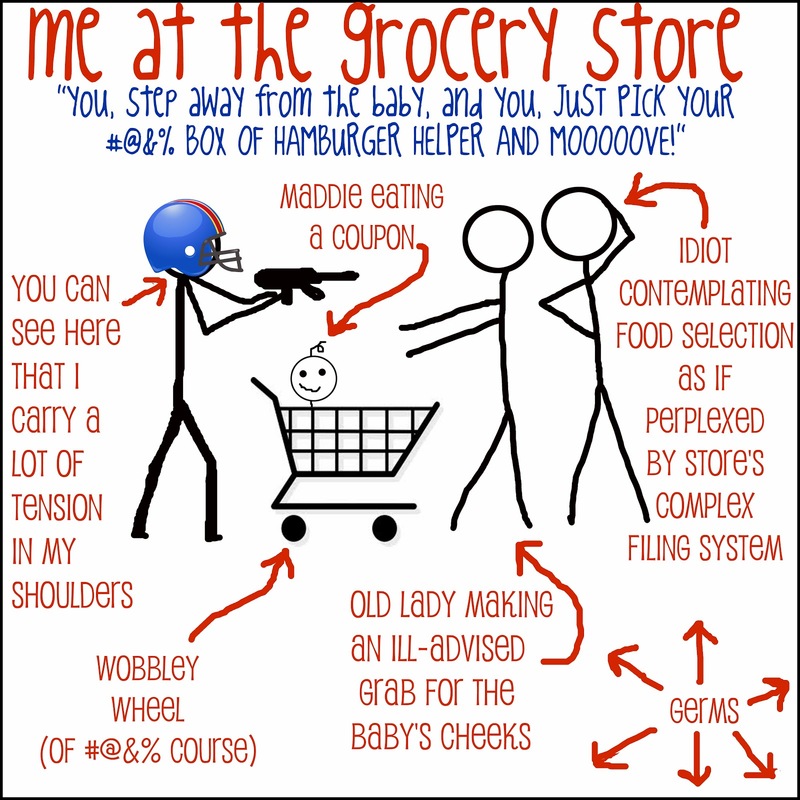 Refrain from murdering the lady who invariably ends up RIGHT IN FRONT OF WHAT I NEEDED TO LOOK AT in every aisle but refuses to budge or even acknowledge that I'm waiting impatiently behind her with a baby who's teetering on the edge of a breakdown (or maybe that was me). Finally, I'd somehow managed to make it to the check-out lanes, where I couldn't help but notice that everyone within a 50-mile radius had also just finished shopping and had gotten in line just ahead of me. I carefully chose my lane, knowing full well that once I made my choice I'd be blocked in there between the magazines and racks of gum like I was in a cattle chute. I also knew full well that, even though it had the fewest people in it with the fewest items in their carts, somehow it would end up being the slowest lane anyway. I was not disappointed. After waiting 20 minutes or so in line, swaying gently the whole time in desperate hopes that Maddie wouldn't notice we'd stopped walking, I was finally next. While the cashier scanned items belonging to the lady ahead of me, I unloaded everything from my cart onto the conveyor belt. I was ready to go. Hang in there, Maddie, I thought. We're almost home free. The cashier announced the lady's total, and I knew we were minutes from freedom. Then guess what happened. No really, go ahead and guess. That's right, the lady pulled out her checkbook. I believe steam may have actually shot out of my ears. It's possible that I audibly groaned, based on the That's Life unsympathetic shrugs I got from the couple that had moments earlier wheeled their cart in behind me (Easy for you to say, childless couple who just got here with your selection of white wine and small, individually foil-wrapped cheeses, I thought with more malice than was probably warranted). But I was in for an even better treat yet, because when the cashier ran the check through the machine that prints the name of the store onto it (because apparently sometimes you want to write a check, except you don't actually want to write anything), I heard her say, "Whoops, it looks like the machine broke." I'm proud to say I didn't immediately freak out and grab the shopper ahead of me by the throat, shaking her to and fro until enough change fell out of her pockets to pay for her stupid single-serve frozen pizzas and Moon Pies so she could just GET OUT OF MY WAY. Instead, I waited. I waited while the cashier attempted to run the check through several more times. I waited while the check-writing lady made suggestions about how to fix the machine, as if she'd grown up on a Check Printing Machine Farm and knew exactly how to handle these types of emergency situations. I waited while the manager was paged, and then I waited while the 19-year-old manager tried to do all the same things the cashier had already done and finally declared the machine Officially Broken. I surveyed my load of groceries on the conveyor belt and very seriously considered just abandoning them there, elbowing by-standers in the eyeballs on my way to the exit if I needed to (or just if I felt like it). But I didn't. When the manager asked me if I'd like to wait 10-15 minutes while the machine was rebuilt from scratch with parts they were going to need to special order from Italy (at least that's what I heard), I tried not to bore holes through her scull with my glare, and instead I gestured meaningfully toward the baby and attempted a laugh, which came out sounding more like a furious chicken being strangled. Back into the cart went my wilting, melting, numerous grocery items. Clumsily, I pulled the cart back out into the Checkout Holding Area, that space behind the checkout lanes where all the livestock (I mean, customers) vie for position to get what we hope will be a decent lane. 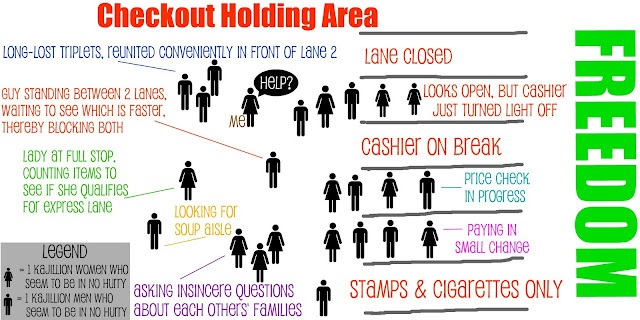 Unwritten Rule #1: There is no eye contact in the Checkout Holding Area. There are no friends, no alliances, there is no neighborly chit-chat in the Checkout Holding Area (except in a few clutches of morons highly social individuals who apparently haven't seen each other since "that time we ran into each other at Waffle House" - those people always have a lot of catching up to do, usually stand (that's right) DIRECTLY IN MY WAY, and never seem to have anywhere pressing to be). At least that's usually the case. But as I stood there, bewildered, ready to bolt and/or punch somebody in the neck, positive that any second now Maddie was going to realize that I'd forgotten her pacifier, I heard a voice, and for once this time it wasn't coming from inside my own head. "You can get in line ahead of me," said the voice. I believe there were also trumpets, and angels singing. The voice was attached to a woman who was about my (undisclosed) age. We will call her Saint Grocery Lady, as is mandatory in my house when she is spoken of. She only had about three things in her basket, yet she was willing to let me get ahead of her in line with my overloaded cart and crumpled coupons and disheveled sweatpants and baby that was potentially about to rip into a blood-curdling scream (as far as any of us knew). I'll bet you didn't even know sweatpants could get disheveled, but that just goes to show how unsavory I looked - yet she was willing to overlook it. And it meant that I would be next. Mercifully, gloriously, wonderfully next. I almost cried. I thanked her about 400 times, but she just shrugged it off. Now that's how you shrug at a stranger, I thought in the general direction of the Wine and Cheese Couple. And that's why I want a million dollars. All I could think about as I gratefully loaded my groceries onto the belt, paid, and thanked Saint Grocery Lady again, was how much I wished I could say to the cashier, "I'm buying her groceries, too." Wouldn't that be awesome? I'd run around rewarding random acts of kindness all day long if I could afford it and if Maddie would promise not to throw up in the stroller while we were out. So once again, thank you to Saint Grocery Lady, wherever you are - for giving me your spot in line, for rescuing a fellow human being just when she her baby was about to lose her mind, and for reminding me that sometimes, when you least expect it, people aren't complete jerks. Sometimes. This is why my mister braves the grocery store ev.er.y.week. I am banned from the grocery. I am sure that my picture adorns their offices "Do not let this unshowered, lactating, mother of 57 screamers, in our lovely grocery." We're a lucky breed - my husband normally does the grocery shopping, too. There should be a whole separate grocery store for those of us whose bodies are producing beverages for the next generation, and/or who have to chase little short people around. 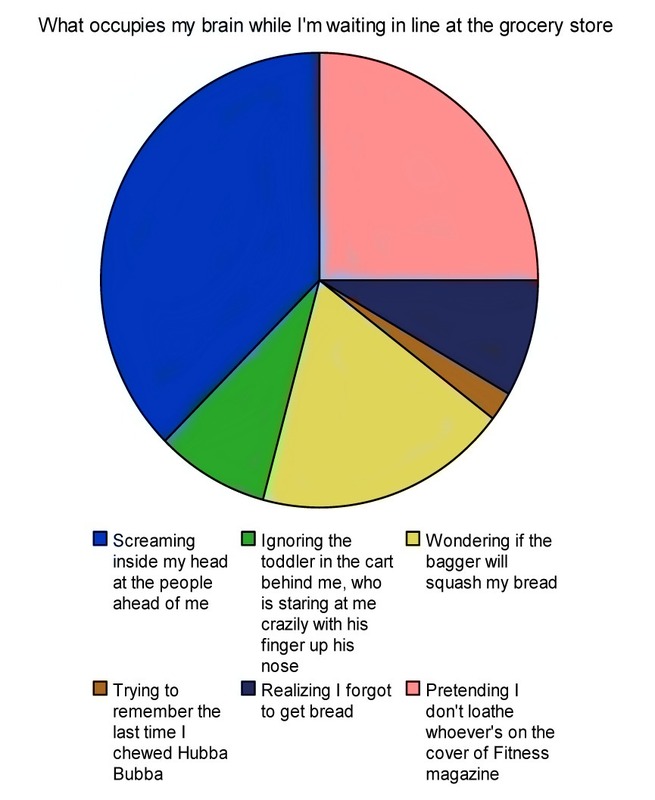 But instead of a grocery store, it should be a quiet room where no one can find us. This is awesome - I especially loved the graphics to go along with it. Thanks for linking up to finding the funny! I'm sharing this on facebook this week! Hey, thanks, Anna! I'm glad you liked it! Very good...now that my youngest is 6 yrs old I have forgotten how trying a trip to the grocery store can be with a baby. I had too, Savannah! Such are the dangers of spacing your kids out in age - you have time to forget too many things (or maybe that's one of the blessings). I love this! Makes me a bit nervous when my first is born in about 6 months. But, I love the detail. It's beautiful. Oh, don't worry, Wisper - it's nothing you can't handle. Besides, the beauty of motherhood is that you're too tired to stay irritated by this kind of stuff. :) Congrats on the wee one, and thanks for stopping by!